This month for Virtual Book Club for Kids we are spotlighting Nick Sharratt. Each month we select a new book by our featured author to share. We always read the book and then do a book inspired craft or activity to help us make connections with the story we read. We have loved reading What's in the Witch's Kitchen? this month and since it is a lift the flap book, we decided to make our own books inspired by this silly and spooky Halloween creation. For the toddler version I prepped the book ahead of time and cut out some flaps and a haunted witch house. I used this stick book making tutorial (that I shared over at Family Your Way) to bind the books. What's in the Witch's Kitchen? 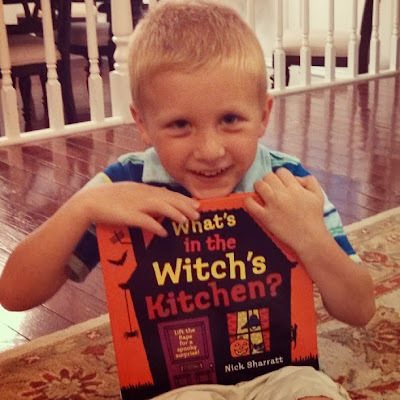 is a fun lift the flap book that helps kids explore a witch's kitchen and discover what is inside. You never know what you might find! My 5-year-old loves it just as much as my 3-year-old. The words are simple & rhyme, the descriptions are silly, and the flaps are uniquely designed. After we read What's in the Witch's Kitchen? then we looked around our kitchen and tried to decide what kitchen items needed to go in our book. We chose the microwave, a cupboard, and a cup. We glued the black haunted house onto cardstock and then we glued one flap of the doors/windows onto the black paper and left the other side unstucked so that we could open and close them. For a toddler I would have everything precut. For older kids they could draw and cut their own flap pieces! In the book, each flap gets lifted to reveal something yummy or yucky or silly or scary... so we talked about what we wanted under each flap and then my daughter drew a picture of what she wanted to see. I labeled each picture based on what she told me. In the microwave we had icky slime, in the cup we had yummy orange juice, and in the cupboard there were burnt ghosts (which were her favorite things in the book too). We used foam stickers to add details to the book. My daughter loves peeling the backs off the foam stickers now (it used to be really hard for her) so I take any opportunity to let her use them. As we read through the book we talked about the name of each object and I labeled what she said with a marker. She loved "reading" the pages to me and telling me about the picture details. Our simple lift the flap book was really fun to make together and gave us a great opportunity to talk about the book and specific details in the simple story. Making your own book is the perfect way to connect with the story and highlight favorite things that you read. It is so easy to see what kids learned (or didn't learn) from a story as you try and re-create it, retell it, or create a new story inspired by the one you read. 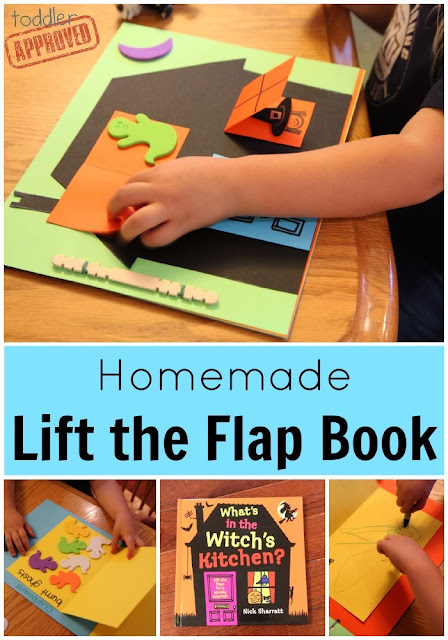 Have you ever made a lift the flap book before? Do you have any other favorite lift the flap books? What is your favorite Nick Sharratt book? If you have blogged about it, we'd love for you to link up your post in the linky below! Link up only posts inspired by Nick Sharratt that share children's book inspired crafts, activities, recipes, etc. Any other posts will be deleted. You can also find loads of Virtual Book Club ideas organized by author and topic on our Virtual Book Club for Kids Pinterest Board that we just started and will continue to be adding to! Come sign up for our Virtual Book Club Newsletter too and check out our new Virtual Book Club for Kids blog! This is super cute! My son loves to look at flap books. I should help him make one like yours. I love reading lift the flap books with children, who really appreciate the novelty and surprise. They are always fun to make and there are so many different ideas that can be used. I like the way you made the activity suit the ages of each of your children. Well done. Both of my boys love lift-the-flap books. I'm not sure what I never made this type of book with them. Well, I know what we will be doing this week! Thanks for the idea. I LOVE it! Since this is one of our favorite Nick Sharratt books we're gonna have to give this activity a try! How fun! My daughter would love this....she loves opening flaps and seeing what's inside! a new world has opened before my eyes....wow!